Honestly, though, if it wasn't for my dad's insanely talented cooking skills, I probably would have eaten plain pasta for years. 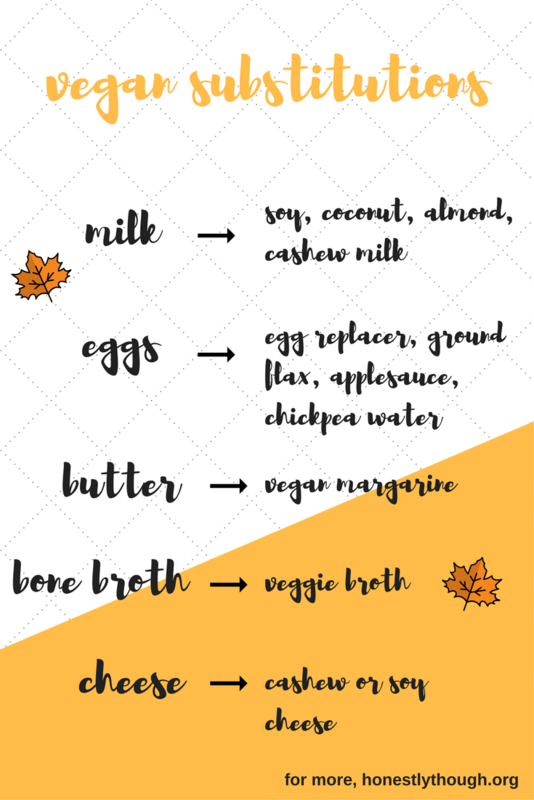 So whether you're newly adapting to a plant-eating lifestyle, have friends and family that are vegan, or you're just looking to cut out some meat and dairy, I hope this guide helps you get there this holiday season. I'm so thankful that I'm able to run this blog, share fellow plant-eater's recipes and (hopefully) fill your Thanksgiving with a few more vegetables. Whole Foods | In hundreds of Whole Foods stores around the country, you can ORDER an entire Thanksgiving dinner (or just a few dishes). Use code VEGAN for $5 off. Trader Joe's | They have TONS of frozen and fresh vegan-friendly options. Just look for the square with a V for Vegan. Sticky Fingers | Grab some of their ready-made sides or mains, and if you're lucky, you'll be able to snag one of their crazy popular pies. Founding Farmers | Order their Thanksgiving To-Go by November 19! Sweet Earth Foods | A ton of frozen options that are perfect as a back-up or for "just in case." I swear by their artisan bowls. Find in almost any grocery store. Loving Hut | A vegan vietnamese cafe with 38 locations around the country. Not exactly "Thanksgiving," but still delicious. Equinox DC | (Not the gym). This amazing, (mostly) plant-based restaurant is open for Thanksgiving this year, and their menu is insanely good. FOR THE CHEESE PLATE: Kite Hill, Miyoko's Kitchen, Field Roast & Treeline.